There are many potential benefits to brewing with a high percentage of oats like reducing common off flavors, improving beer stability, and improving yeast health. The Schnitzenbaumer study on unmalted oats also noted that beta-glucan in concentrations lower than 800 mg/L is not the predominant viscosity-altering substance in wort implying that proteins and starches also contribute to the mouthfeel viscosity. With this logic, it would suggest that to achieve a more viscous mouthfeel by the use of oats would require about ≥18% of oats as a percentage of the grist to get over this 900 mg/L threshold (this is in a mash with a total of about 20 total pounds of grist). The obvious downside to having increased levels of beta-glucans in wort, thus increased viscosity, is potential problems with stuck sparges, problems transferring/pumping, slower filtration, lautering, and and beer clarification. Lower temperature rests can help with with this problem as well as other options like using rice hulls in the mash or even a mash filter. I have successfully used 40% raw milled oat groats in a mash without such precautions in a no sparge batch. Usage of only 10% oats in a mash has been shown to have no direct impact on lautering rate however. There are other potential ways to deal with increased level of beta-glucans in the mash like using 6-row as a base malt. Typical 6-row malt is less viscous than 2-row as well as has more diastatic power (more enzymes), which isn’t necessary for conversion with a high percentage of oats, but could be beneficial in overall conversion and faster run-off from the less viscous wort. Increased enzymes when added directly to the mash via protease has been shown to decreased viscosity, which can lead to higher filtration rates, increased yield, as well as the added benefit of being able to use larger amounts of adjuncts, like oats, in a mash.3 This would imply that although the additional enzymes from a 6-row base could have a similar positive affect on the mash with the increased levels of beta-glucans from the oats. Many online sources recommend a cereal mash when using raw oat groats because unlike flaked oats which have already been gelatinized in the flaking process, raw groats are exactly that, raw. A cereal mash allows you to cook the adjunct used in brewing to gelatinize them which will allow mash enzymes to access the starches. I don’t think a cereal mash is required when using raw oats however. As you can see from the above gelatinization ranges, oats nicely fall right into the range of most typical mash temperatures. In addition, a study looking closer at the ranges found the onset gelatinization temperature is approximately 140F with peak gelatinization temperature approximately 147F and conclusion gelatinization temperature of approximately 155F.5 It seems then, that as long as you are mashing on the hotter side, you should be fine getting conversion without a cereal mash. In a mash consisting of 40% raw oat groats and 60% 6-row, I achieved a mash efficiency of 64% and it took close to two hours to achieve full conversion (I also milled the oats twice). This would suggest that a cereal mash may allow you to speed up the mash process, however, the process of a cereal mash itself takes time. This lower efficiency is one of the downsides of increased usage of oats. Literature has cited that the extract content of malted oats amounts to only 70% to 75% of malted barley.6 The Schnitzenbaumer study on raw oats found a 17% reduction of total fermentable sugar content of word when replacing 40% of barley with unmalted oats. Free Amino Nitrogen (FAN), the level of amino acid nutrients in wort used by the yeast for healthy fermentation is typically supplied by malted barley. However, there is a concern when the level of adjuncts in a grist increases, the FAN level of the wort also decreases which could lead to poor or slow fermentation. This is the case with oats, with no oats (100% malted barley) the FAN was measured at 177mg/L with 40% of the barley substituted for raw oats, the FAN dropped to 131 mg/L.7 A more recent study on on the fundamentals of yeast nutrition recommends lower levels of FAN than was typically quoted in brewing literature saying the minimum FAN content in wort should be 100mg/L for healthy yeast.8 So it appears that using oats even up to 40% (or even more) of the grist, there really is no concern with FAN for yeast health. Ester production stemming from increased amount of oats led me down a rabbit hole of studies with conflicting results. First, after learning about the reduced levels of FAN with oats, I’ll start by sharing a study that found flavor-active acetate ester production is reduced with low wort FAN and glucose levels.9 So there is one small hint of lower ester production with oats. Next, oats are high in total fat compared with malted barley as well as other adjuncts. The chart below compares the typical nutrient facts of oats vs. hulled barley. The Schnitzenbaumer study found that higher containing unmalted oat worts had about 50% less fructose and glucose than 100% barley malt. So knowing there is less fructose and glucose in oat worts, it’s interesting to then learn that high gravity worts with elevated maltose concentrations produce lower levels of acetate esters than similar gravity worts with high levels of glucose and/or fructose.16 So it may be possible that lower fructose and glucose concentration (oats) could result in less ester production. A follow-up study on the role of esters and unsaturated fatty acids disagreed with the previous claims. They did not find a link in linoleic acid to the reduction of esters, saying that “if unsaturated fatty acids inhibit the enzyme (as MacDonald said above) both the inhibition and the induction of the enzyme would have to occur at the same rate to explain the data.17 In addition, the Schnitzenbaumer study found a 14% increase in esters with 40% unmalted oats. I think it’s definitely worth experimenting with a yeast strain known for high ester production (Conan for example) with a high percentage of oats and see if lowers the perceived esters. Of course reducing esters may not always be your goal. I like to try to contain ester formation in hoppy beers because I think it allows me to have more control over the final product because esters can blur the lines between the hop flavors and aromas and the esters. Interestingly, the increase of fatty acids and lipids in worts high in unmalted oats was found to be a positive on yeast cell growth. As the oats in the mash increased in the Schnitzenbaumer study, the lag phase of the yeast decreased with the oat containing beers having a 94% higher yeast growth after the first and second days of fermentation than a beer brewed with 100% malted barley! This same study observed that the fatty acid content in beers produced with 40% oats had 60% less fatty acids in the final beer than with beers made from only malted barley. Wait what? Yup, this means that the higher levels of fatty acids coming from unmalted oats are being metabolized by the yeast at a much higher rate thus not making it into the final beer according to this study. The higher yeast growth and reduced lag time resulting from the increase in fatty acids seems to make a great case for using high percentage of unmalted oats when making yeast starters! The higher level of fatty acids in oats also might play a positive role when using yeast strains that are many generations old. Harvested yeast that is continually reused for brewing results in a reduction of unsaturated lipids in the yeast cells and a deterioration of growth during fermentation.18 It was found then that yeast supplemented with lipids, especially unsaturated fatty acids (which oats are high in) improved fermentation.19 Although this was direct supplements of fatty acids, it does seem logical to conclude that high lipid worts from adjuncts like oats, could help improve fermentation of older generation yeast. This again makes a decent case for using oats in starter wort. The Total Soluble Nitrogen (TSN) has been found drop in worts high in oats. Malt analysis of oats shows a very low level of nitrogen modification, which leads to low malt soluble nitrogen. After boiling the soluble nitrogen content of high oat wort saw a drop even more by 50%, meaning only some of 10% of the original total nitrogen remained soluble in the wort (keep in mind this is for malted oats). 20 Taylor also found in this study a drop in head retention when oats were used, which is “almost certainly related to the lower soluble nitrogen content present and is probably not related to the high lipid content of the oats.” This would also align with the discovery above that the high lipid content in beers with high percentage of oats actually has less fatty acids in the final beer most likely because of the role of yeast the first couple days after pitching. This would seem to disagree with the common perception that the high percentage of fats in oats leads to poor head retention, since it doesn’t seem it’s making it into the final beer anyways! The Schnitzenbaumer study also looked at head retention in oats and found when using oats at about 10% of the grist, there was no negative effect on head retention. 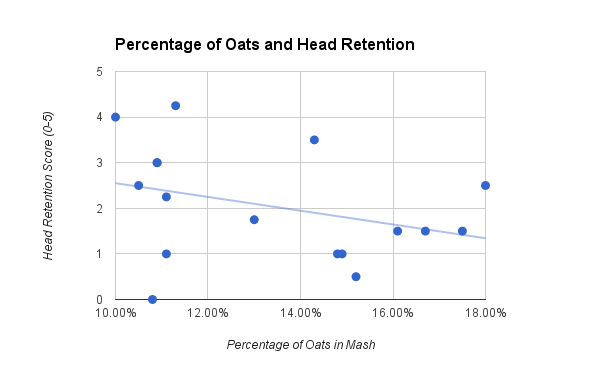 However, as the percentage of oats increased above 10% the head retention suffered fairly dramatically. Specifically, beers with 30%-40% oats had the lowest levels of head retention. One of the many things I rate on each beer I brew is the the head retention on a score of 0-5. So based on this information, I charted all of the beers I have brewed where the total oat content of the grist exceeded 10%. As you can see, in the 17 different beers, there was a negative correlation with the increase in oats to head retention, which would align with the studies. There are numerous ways to try to increase the head retention of beers made with high percentages of oats. Things to consider would be using higher protein content malts like wheat or spelt as a small portion of the non-oat grist. Using a higher percentage protein basemalt like 6-row, may also help. Intermediate ABV beers have better head retention than extremely low and high ones. In addition increasing the IBUs (iso-alpha acids) in the beer could also help as they are foam positive (pale ales and IPAs).21 More specifically, using higher percentages of low cohumulone hops has been shown to slightly increase head retention.22 But more details on improving head retention is probably worthy of its own detailed post. Because husked and naked oats causes a marked reduction in nitrogenous compounds in mashes which results in higher pH values, making adjustments to your mash may be necessary when using a high percentage of oats.23 Both the Koch and Schnitzenbaumer studies found an increase in mash pH with malted and unmalted oats, which occurred more drastically with +30% oats in the mash. The fermentability of worts high in oats is another factor to consider when putting together a recipe high in oats. The fermentability of worts drops noticeably with increasing amounts of husked/naked oat grain.24 The Klose study on 100% malted oats experienced approximately a 11% decrease in ABV with 100% oat malt vs. 100% barley. This may make the case that oats could be used in session beers when you want a lower ABV, but still have some body remain to have the impression of a bigger beer. Lower fermentability might not always be the case, it was found that worts containing up to 70% commercial wholegrain oat flour show higher extract contents and similar apparent attenuation limits as standard worts.25 Of course brewing with 70% flour can be troublesome, but it’s certainly possible when using a mash filter of some kind. I have not yet tried to grind oats to a flour to see if my fermentability increased as a result however. 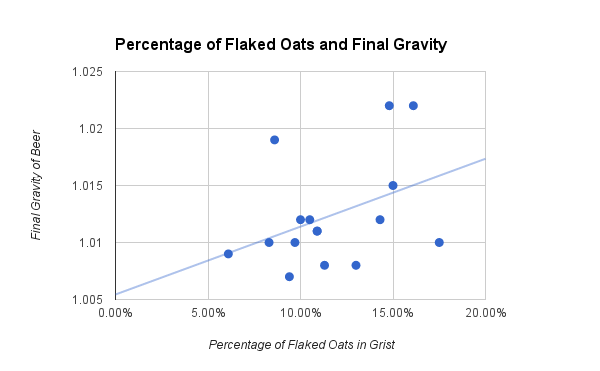 I again looked at my experience with flaked oats to see if there was a correlation between oat percentage of the grist and the final gravity of beer (lower fermentability). I removed all of the beers that were made without clean ale yeast (any saisons, sours, etc.) which ended up being 16 beers. There was a correlation coefficient = 0.397, which means there was a small relationship showing an increase in final gravity with an increase in flaked oats as a percentage of the grist in my experience (chart below). Acetaldehyde can be detected in both the aroma and flavor of beer. It’s not typically considered a good thing, often described as coming off like bruised apples, green apple, latex paint or musty. Acetaldehyde is found in greater amounts in young beer, but typically decreases as fermentation finishes. The perception threshold for acetaldehyde is 5-20 mg/l, where 6-8 mg/l is perceived as fruity and higher levels is more of the green apple aroma.26 In the Schnitzenbaumer study on unmalted oats, beers brewed with unmalted 40% oats saw a 36% reduction in acetaldehyde from 11.05 to 7.10 mglL (taking the beer into the fruity perception levels). This was also backed up in another study that found that fermentations in the absence of unsaturated fatty acids, which oats are high in, the yeast formed more acetaldehyde, SO2, and dimethylsulfide when unsaturated lipid biosynthesis was blocked.27 Moreover, the Klose study on 100% oat malt found approximately 60% less acetaldehyde in 100% oat beer vs.100% barley beer. Score another one for oats! Sulfur dioxide can be another off flavor in beer. At higher concentrations (greater than 20ppm) it can come across as a lit match. Other sulfury flavors can be rotten eggs, rotten vegetables, skuny, and burnt rubber..yum. A small amount of sulfur dioxide is typically formed during fermentation (more so in lager fermentations) but hopefully most is removed by the end of the ferment. Here come the possible benefits of oats again, it was found that yeast supplementation with lipids can be used as an effective means to reduce the amount of sulfur dioxide during fermentation while stimulating overall yeast growth. This same study concluded that there was a 64.3% reduction in sulfur dioxide formation when fermentation was carried out by lipid supplemented yeast compared with the control.28 It’s worth pointing out that the supplementation of lipids was not in the wort, but directly to the yeast, however it does at seem to at least show a positive potential role in lipids (oats) to reduce sulfur flavors in beer. Another positive in brewing with oats is it’s ability to improve beer stability. The Taylor/Humphrey study found that there is no reduction in flavor stability detected in oat beer, in comparison with equivalent products (up to 12 months storage in the bottle). In addition, back to the Schnitzenbaumer study, a significant decrease of aging indicators was found in beers made with 30-40% oats. They found a big reduction in both heat indicators as well as staling components. In some cases, the reductions were as high as 79%-83%. The Klose study also found lower levels of all heat, oxygen and staling indicators in 100% oat malt beer vs. 100% barley beer. Again, the more of the percentage of oats in the grist increased so did the reduction of aging components! Polyphenols can have a negative impact on beer stability. Specifically, polyphenols promote free radical relations, which results in the formation of beer staling.29Here again, oats have been shown to significantly decreases the wort polyphenol concentration when using 20% or more oat grain. 30 It seems worthwhile to experiment with a high percentage of oats in beers intended to be aged, like sours and barleywines! It may take up to 18% of the grist to start getting a silky mouthfeel from oats, which is much higher than I previously thought. There are ways to deal with the increased viscosity of worts high in oats resulting from the high beta-glucan content like mash filters, less viscous base malts (like 6-row), enzyme supplementation, rice hulls, and lower temperature rests. When using raw oat groats, you may not have to do a cereal mash if you are mashing on the higher end. When I have brewed with 40% raw steel cut oats, I milled the groats twice through my mill and was able to achieve 64% mash efficiency after a long 2 hours mash (using oat flour may also boost efficiency). High percentage of oats may limit ester production in beers, although I’m not completely confident in this claim. A high percentage of unmalted oats may be beneficial to use in starter wort to improve yeast health, especially in late generation yeasts. Beers high in oats will likely have poor head retention. Beers high in oats will likely ferment less than beers with 100% barley, so expect slightly higher finishing gravities as the oat percentage increases. Beers high in oats could potential reduce common off flavors as well as improve beer stability. Ragot, F., Guinard, J.-X., Shoemaker, C. F. & Lewis, M. J. Journal of the Institute of Brewing, 1989, 95, 427. Schnitzenbaumer, B., Kerpes, R., Titze, J., Jacob, F., and Arendt, E. K. (2012) Impact of various levels of unmalted oats (Avena sativa.) on the quality and processability of mashes, worts and beers, J. Am. Soc. Brew. Chem. Changes in the Chemical Composition of Beer During the Brewing Process as a Result of Added Enzymes. (1980). Journal of the American Society of Brewing Chemists ASBCJ, 38. H. (2013). Topics in Brewing: Brewing Adjuncts. Technical Quarterly TQ. Hanke, S., Zarnkow, M., Kreisz, S., and Back, W. The use of oats in brewing. Monatsschr. Brauwiss. 58:11–17, 2005. Maskell, D. L. (2016). Brewing Fundamentals, Part 2: Fundamentals of Yeast Nutrition. Technical Quarterly TQ, 53. Youngs, V. (1978). Oat Lipids. Ceral Chem., 55(5). Evans, D., Goldsmith, M., Redd, K., Nischwitz, R., & Lentini, A. (2013). Impact of Mashing Conditions on Extract, Its Fermentability, and the Levels of Wort Free Amino Nitrogen (FAN), β-Glucan, and Lipids. Cerevisia, 38(2), 52. MacDonald, J., Reeve, P.T.V., Ruddlesden, J.D. & White, F.H. Progress in Industrial Microbiology, Ed. Bushnell, M. E. Elsevier; Amsterdam, 1984, Vol. 19, 66-75. Klose, C., Mauch, A., Wunderlich, S., Thiele, F., Zarnkow, M., Jacob, F., & Arendt, E. K. (2011). Brewing with 100% Oat Malt. Journal of the Institute of Brewing, 117(3), 411-421. Stewart, G., Lyness, A., & Younis, O. (1999). The Control of Ister Synthesis During Wort fermentation. Technical Quarterly, 36(1). A New Model for the Regulation of Ester Synthesis by Alcohol Acetyltransferase in Saccharomyces cerevisiae During Fermentation. (1991). Journal of the American Society of Brewing Chemists ASBCJ, 49. Uptake of Linoleic Acid by Cropped Brewer’s Yeast and Its Incorporation in Cellular Lipid Fractions. (2003). Journal of the American Society of Brewing Chemists ASBC. Andreasen, A. A., and Stier, T. J. B. Anaerobic nutrition of Saccharomyces cerevisiae. II. Unsaturated fatty acid requirement for growth in a defined medium. J. Cell. Comp. Physiol. 43:271-281, 1954. Taylor, D. G., & Humphrey, P. M. (2008). Brewing of English Style Ales with Malted Cereals, Other Than Barley. Scandinavian Brewers Review, 65(1). Bamforth, C.W. The foaming properties of beer. J. Inst. Brew. 91:370-383,1985. Schnitzenbaumer, B., Kerpes, R., Titze, J., Jacob, F., and Arendt, E. K.(2012) Impact of various levels of unmalted oats (Avena sativa L.) on the quality and processability of Soc. Brew. Chem. 70, 142–149. Schnitzenbaumer, B., Kaspar, J., Titze, J., and Arendt, E. K. (2014) Implementation of commercial oat and sorghum flours in brewing,Eur. Food Res. Tech. 238, 515–525. Barnes, T. (n.d.). The Complete Beer Fault Guide v. 1.4. Role of Oxygen in High-Gravity Fermentations in the Absence of Unsaturated Lipid Biosynthesis. (1993). Journal of the American Society of Brewing Chemists ASBCJ, 51. James, M. (2013). Direct Supplementation of Yeast with Lipids as a Means to Reduce Sulfur Dioxide Formation. Cerevisia, 38(2), 55. Irwin, A.J., Barker, R.L., and Pipasts, P. The role of copper, oxygen and polyphenols in beer flavor instability. J. Am. Soc. Brew. Chem. 49:140-149,1991. Schnitzenbaumer, B., and Arendt, E. K. (2013) A comparative study of oat (Avena sativa) cultivars Tech. 236, 1015–1025. So basically raw oats would be similar to so,ething like steel cut oats? I have been brewing for quite some time with oats. However, I usually limit myself to flaked or toasted flaked at no more than half a pound. Recently, I stopped at Tree House Brewing Company and was introduced to the NE IPA, which began my obsession with mouth feel and creamy beers with head retention likening that of custard. Would malted oats have essentially the same effect, also contributing some flavor complexity, or is it only the unmalted variety that aids in mouth feel? I have an idea to add some to a NE IPA as well as play with a traditional Hefeweizen (50% Barley, 50% wheat/malted oats/malted spelt). Your thoughts are tremendously valued and I appreciate the amount of effort you put in your articles. Malted oats should have the same effect as flaked. I recently heard a podcast (link below) where Tired Hands uses as much as 30-40% malted oats in some of their beers and they have that smooth silk like mouthfeel. I’ve recently encountered two studies that seems to provide contradictory data on two different aspects mentioned here. Each is within a context that’s at least a little different, but I would think the results would apply. I’m curious if you have any thoughts on these. It’s a little hard for me to follow, but it looks like https://www.researchgate.net/publication/303371553_Characterization_of_the_Strains_Isolated_from_Kefir_Grains_and_their_Use_for_the_Production_of_Beer-based_Fermented_Beverages_from_Nontraditional_Cereals indicates that beer made from 100% oat malt was high in DMS, although the levels were below sensory threshold. Thanks for all the work you put into your site, it’s an amazing resource. Thanks for sharing these studies! I’m a little surprised by their finding in terms of DMS in a 100% oat malt beer, the study says they tested DMS at 500 µg/l (the threshold for DMS is 30-60 µg/L) yet they concluded that at these levels the DMS had no impact on the sensory evaluation. That just doesn’t seem to make any sense to me. In terms of the FAN concentrations, both studies (the one you shared and the one I cited) basically have the same finding of only 16 mg/L difference between the two. Scott, I was reading up on Schnitzenbaumer’s paper that you referenced. At the end of chapter 7 is a table with sensory panel results. It seems that tasters were not able to tell a difference in perceived mouthfeel/body in any of the beers when compared to beer brewed with 0% oats. So although oats do increase the viscosity of liquid linearly (with B-glucans being the predominant altering substance at >800mg/L), it is not accurate to say it affects mouthfeel. Another interesting observation is that the 0% beer was scored 4.4/5 for fullness of body. So it could be that the mash schedule and lager yeast used in the experiment played a much bigger role in the body than the oats. The oats could very well have played a part in increasing body/mouthfeel but was overshadowed by a hidden factor. I wonder if viscosity can be perceived as different than fullness (I believe the study had the panel rate fullness of body). In oat heavy beers that I have brewed there is a noticeable silkiness, but some of these have also come across a little thin. Bumping protein-rich grains like malted wheat in combination with oats has seemed to help a bit with getting both body and silkiness. I’m curious if others have had similar experience with oat heavy beers. I have a problem with oats and head retention. Every time I use them, head suffers. I can’t believe your theory that the reason behind this is lower soluble N, as I made brews using the same amount of malts with and without additional OG by oats and noticed a big difference. Total amount of soluble N should be the same in both, if not higher in the oats beer, as all the other malts are the same. It must be the oil content..
You provide a gelatinization range (135-162f) for oats that is well above the range (127-138f) provided by the BeerSmith cereal mash link in the above article. How would you explain the discrepancy? I’m not sure what source was used for BeerSmith, but I cited mine for the gelatinization range.